As any passionate traveler knows, sometimes things go less than smoothly during a journey abroad. 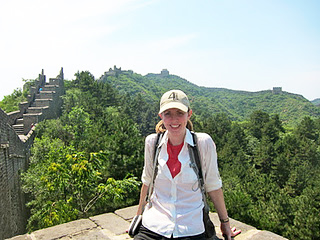 For Dr. Suzanne M. Miller, a bump in the road during her travels along the Silk Road in Xinjiang, China, proved quite literal, when she and her fellow travelers found themselves involved in a car accident. wanderings around the world on The Adventures of Dr. Suzie. I never thought I could learn so much about another culture by witnessing a car accident. Seeing how the locals responded to an emergency situation along the Silk Road in Xinjiang, China, taught me more about life in this remote part of the world than our days spent strolling the streets, sampling new foods, and bartering at markets. After serving on the medical team of an adventure race in the Gobi Desert, Rick, Charlie, and I decided to explore more of the Xinjiang Uyghur Autonomous Region along the ancient Silk Road. Xinjiang, which literally means “New Frontier,” is the largest region in China, bordering Mongolia, Russia, Kazakhstan, Kyrgyzstan, Tajikistan, Afghanistan, Pakistan, and India. Like the wild west of the United States, Xinjiang has flown many flags,which has led to its current melting pot of cultures. We started our exploration in Xinjiang’s capital Urumqi, a small Chinese city of about 3 million residents where endless blocks of nondescript apartment buildings line eight-lane highways and construction cranes fill the skyline. I felt some initial trepidation visiting Urumqi given that tensions between Uyghurs, the Muslim predominant ethnic minority, and Han Chinese, the current ethnic majority, ignited in violence leaving 200 dead in 2009. I was pleasantly surprised that the political undercurrent could not be felt as we wandered from one Uyghur restaurant to the next, sampling the region’s famous pulled noodles called laghman. Unfortunately, food seemed to be Urumqi’s only highlight, and we soon tired of the city’s frantic pace. It was hard to believe a town located 10km from present day Urumqi once served as a sleepy tax collection site along the northern route of the Silk Road. Unimpressed with Urumqi, we took a 24-hour train ride to Kashgar looking for a more authentic Silk Road atmosphere. Kashgar immediately felt different. Though some of the typical high-rise buildings covered in neon lights favored by the Han government have made their way to this western outpost, Kashgar has a more remote and untamed vibe. Old Town provided the exact ambience we were looking for on the Silk Road. 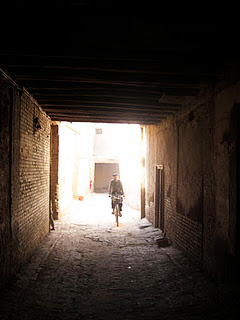 This picturesque area sits at the heart of Kashgar and has inspired many movie sets, including those in The Kite Runner. Maze-like dirt streets snake through mud-colored, two-story brick houses with simple wood doors. Some streets were eerily empty while others were filled with dirt-covered children playing with simple toys and cackling with laughter. Markets filled the edgesof Old Town and we happily spent our days bartering over tea and hand-made instruments, marveling at the roadside melon mounds, and enjoying the rich smell of lamb kabobs cooked on the open grill. 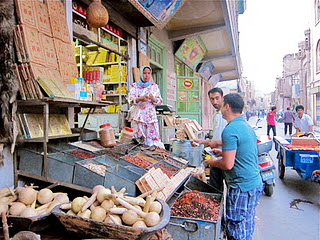 I could easily imagine merchants from all over Central Asia traveling along the Silk Road to Kashgar to sell their wares and replenish supplies. 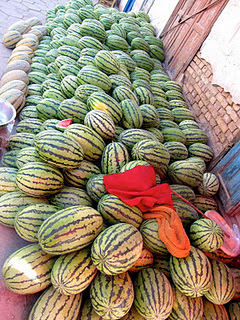 Melon mounds line the roads in Kashgar Old Town. Kashgar unfortunately shares Urumqi’s chaotic driving style. Cars, mopeds, and bicycles enter into an intricate dance, vying for space and right of way. As long as everyone performs predictably while cutting others off, turning without looking, and ignoring lanes, the choreography works. One false step or hint of indecisiveness and the entire routine collapses. As emergency medical providers, we marveled that more accidents didn’t occur on these streets where traffic rules seem to be taken as mere suggestions.We shouldn’t have been surprised, then, when on the way to the airport, a false step led to the inevitable. Most Kashgar cabbies drive as if they are in the Monaco Grand Prix. But our driver added his anger to the usual competitive spirit as we took off for the airport. From minute one, he shouted hysterically at surrounding cars while passing over the double yellow line into oncoming traffic to gain a one-car length advantage. I began pantomiming “slow down” with little effect, and then I held on and tried not to look. The cab hit her on the left side and she tumbled to the ground just in front of the right tire. She fell onto her left leg, the black hijab fluttering in the breeze, as she crumpled into a ball in obvious pain. Here we were, two emergency physicians and an emergency technician, the passengers in a cab in Kashgar, China that had hit a woman riding a moped. We didn’t speak Uyghur or Chinese. We were dressed in Western garb and were obviously foreign. We needed to get to the airport and go home, but Rick and I had taken the Hippocratic Oath. We jumped out of the car and my mind immediately turned to providing spinal precautions. Rick focused on getting the victim out of the middle of the road. Charlie’s attention turned to preventing our bags from being stolen. Horns blared because the stopped cab and moped blocked an already busy intersection. The cacophony increased exponentially as a crowd consisting of all men, young and old, Uyghur, Kyrgyz, Tajik, and Han, arrived. A very Xinjiang peanut gallery. No one touched the victim as she lay on the ground. The nearest group of men uprighted the bike and began a debate with the cabbie, clearly trying to determine who was at fault. As the only other woman present, I pushed through the crowd and knelt down in front of her. Unable to speak much Uyghur or Mandarin, I asked if she was ok in English but received no response. The woman didn’t say a word but moaned and pointed to her left leg. The jury of men did not touch her due to cultural respect, and she shooed me away when I tried to assess the possible injury to her leg. The crowd grew and pressed in intimidatingly, the inner circle contracting while the outer rim expanded. Suddenly, she motioned for help to stand up. Dozens of hands reached in to assist as she rose shakily, placing most of her weight on the right leg but gingerly moving the left. So much for spinal precautions. With her upright, the crowd’s debate gathered steam while Rick, Charlie, and I had our own discussion ignored by all others. Finally, she spoke. Not spoke, ignited. 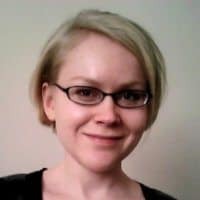 Like a dragon spewing fire, she verbally attacked the cab driver with a vigor that certainly proved her airway and breathing were intact. Rick, Charlie, and I all breathed sighs of relief because the patient did not appear to have any life-threatening injuries,yet the crowd became even more animated. After a heated exchange between the victim and cab driver, both turned to the crowd and engaged in the ongoing debate. Passionate hand gestures filled the air and a group of Uyghurs with traditional beards and white caps recreated the accident scene. 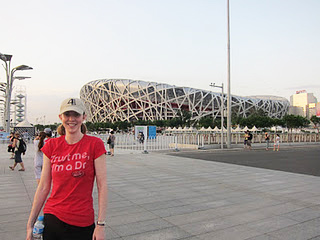 Dr. Miller finally made it to Beijing. With the deliberations well under way, we quickly decided it was time to leave. As we grabbed our bags, the cab driver switched his attention from the accident debate to his lost fare. He tried to throw our bags back in the car and implored us to continue to the airport. Not interested in helping the driver leave the scene of an accident, we fled ourselves, carrying hefty packs and darting through the built up traffic to a nearby restaurant. There, we saw two police officers having lunch, seemingly oblivious to the scene in front of them. While we frantically hailed a cab, minutes ticking down until our flight, a police officer drove past the accident site and didn’t even slow to look. Safe inside another cab, we passed the still hectic scene and admired the woman’s hutzpah as she took on the all-male, self-nominated jury who undoubtedly decided which driver was at fault by the time our plane took off for Beijing. Once Rick, Charlie, and I made it safely into the air en route to Beijing, we marveled at the lack of police and paramedic presence at the accident in Kashgar.We are accustomed to traffic accident witnesses and victims calling on public servants to ensure the health of all parties, and then to determine fault. Along the wild west of the Silk Road, in a society renowned for its ethnic diversity, entrepreneurial spirit, and physical endurance, Kashgar residents sometimes rely on the community to serve as doctor, lawyer, judge, and jury. As much as I learned about Kashgar customs from witnessing the traffic accident, the next time I visit Xinjiang I’ll skip Urumqi and head directly to Kashgar’s enchanting Old Town, where I can sip endless pots of tea with the cab drivers instead of sitting in their back seats.